The opening day launched the photographs on Sharmila by Drik India Kolkatta and Peace Counts. Ma Maheswata Devi also released a book on Sharmila ‘BURNING BRIGHT’ written by Deepti Priya Mehrotra, published by Penguin. Ma encouragingly assured the audience that an alternative Bengali version of the book would be made available in the next year and in all the Indian languages in succession. The President of the function Mangol Devi, a veteran Meira Paibi leader reminisce the audience with her wily adventures with the security forces of Manipur putting the audience to fits of laughter. A Manipuri adaptation of the novel HAZAR CHOURASIKI MAA written by ma Maheswata Devi staged by the Aryan Theatre group folded the day. The following day, a brigade of the popular artists of Manipur treated the audience to an anthology of songs titled “keishumshangee rani” (the queen of the jail) with the lyrics written by Irom Sharmila. 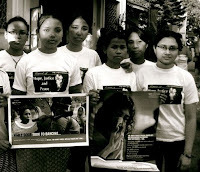 The 4th November, all were assembled in the PDA complex, Porompat where a relay hunger strike has been going on since December 10 2008 by the Sharmila kanba lup. The JN hospital where Sharmila is securely confined is about 10 mins walking distance from this place. A mob of women of varied age groups from the Moreh town bordering Myanmar also thronged the place to participate in the dharna. Two significant incidents happened that day. First, it was the arrival of Dayabai (a woman activist) from Thinduara Madhya Pradesh who resembles any ordinary village woman but had the eloquence of a savvy tigress. She lives in a village where there are no newspapers, television but she read about Sharmila during one of her tours in the town. Ma Maheswata Devi had expressed her desire to meet Sharmila and her brother Irom Singhjit had already filed an application on the 26th October but it was disgustingly not processed. So on that day, she hopped on to a jeep and made way for the Chief Secretary’s office. In the office premises. she broodingly waited for about 50 minutes but the Chief Secretary refused to meet ma Maheswata reluctant to recognize her. The next day, the 5th November in the Manipur University campus, Canchipur ma inaugurated the Human Rights Film Festival organized by Indian Social Action Forum (INSAF) and spoke to the media. She condemned the Manipur Chief Secretary and propounded the need to start his education all over again from the basics. And she bade farewell for the airport. Early morning the next day, a crowd was assembled in the historic Nupilal Complex where an all community prayer meeting was organized. A collective feast at the Narasingh temple wrapped up the 5 days long festival. .